THE son of an Inverness shoemaker, William MacBean was one of a rare breed of Highland soldiers who rose from the lowest rank of the British Army to join the elite corps of senior officers. It would be considered an achievement even today, but in the rigid structure of Victorian society that kind of upward mobility was the stuff of which legends are made. Dingwall and the Black Isle made a local hero of Major General Sir Hector MacDonald, the victor of Omdurman, while Inverness honoured the military success of Major General William MacBean, V.C. He joined the Army as a private soldier, served with distinction in the Crimean War and the Indian Mutiny, where he earned the Victoria Cross at the Relief of Lucknow, and eventually rose through the ranks to become Colonel of his regiment. He was born in Inverness in January 1819 and at the age of 16, much against the wishes of his parents, he enlisted in the 93rd Sutherland Highlanders. “General MacBean was the son of a shoemaker in Inverness and his career has often been quoted as a remarkable example of promotion in the army,” observed the Courier after his death. “It was during the Crimean War that, with the hearty concurrence of his commander Colonel W. B. Ainslie, he received a commission as ensign. From this point honours lay thick in his way. Soon after receiving his commission he was ordered to remain behind his regiment at Varna, in charge of the men invalided there. “At this place there were also stationed a number of French and Turkish soldiers between whom, on the occasion of some dispute, Ensign MacBean interfered so successfully that the Sultan rewarded him with the Order of the Medjidie — a distinction which the recipient, with characteristic modesty, did not mention to his friends till some time afterwards, when some accidental reference happened to be made to what had occurred. According to one account, MacBean became well acquainted with Florence Nightingale while in the Crimea, and was one of the first professional soldiers to recognise the importance of her work among the men. “Rejoining the 93rd before Sebastopol the deceased shared with his comrades the dangers connected with the siege; and he afterwards bore a part in the expedition to the Sea of Azoff, and in the capture of Kertch and Yenikale,” the Courier’s obituary tribute went on. One of his supposed ancestors, Gillies MacBean of Kinchyle, is said to have died performing a similar feat at the Battle of Culloden, slaying 13 dragoons single-handed and on foot. After Lucknow one of the Indian princes is said to have offered MacBean the command of his army, but the invitation was declined “even though a handsome fee was added to the offer”. 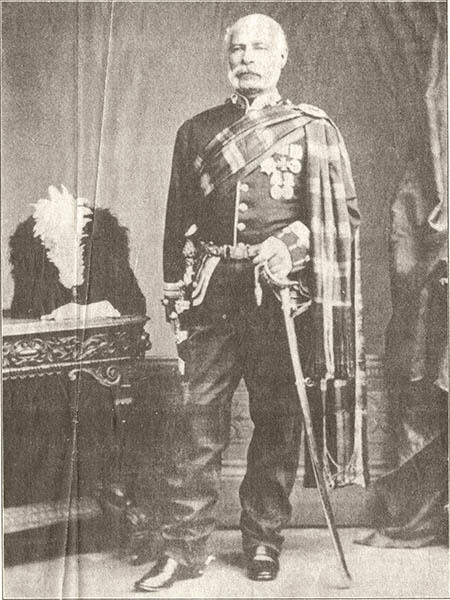 MacBean’s active service came to an end with the suppression of the Mutiny, but he remained an officer in the 93rd (which later became the Argyll and Sutherland Highlanders) and in 1873 he was gazetted as Lieutenant Colonel. He was given the rank of Major General on his retirement from the regiment in January 1878, but he died at Woolwich a few months later, on 22nd June, and was buried in the Grange Cemetery, Edinburgh. “Notwithstanding his presence in many posts of danger, Major General MacBean never sustained any very serious wound,” the Courier noted. The Times of London also paid tribute to the Inverness-born “ranker”, describing him as a man distinguished in every rank and idolised by his regiment. General MacBean was married on his return from India to a Miss Beveridge from Kirkcaldy, but she and their only child predeceased him. He is now virtually forgotten in the town of his birth, although his bust can still be seen in a corner of the Town Hall. It was presented to the town in 1897 by the family of his brother, James MacBean, a former Dean of Guild. The giant Clan Chattan confederation could have been the greatest fighting force in clan history. Not even the Camerons, the MacDonalds or Frasers would have been a match for the massive alliance of Macintosh, Macpherson, Davidson, Shaw and Farquharson. Fortunately, or unfortunately—depending where your sympathies lie—the confederation was never welded into a really united and compact unit, though their influence was considerable. Among the minor clans who allied themselves to Chattan was the Clan MacBean or McBain. These clans did not lose their identity in any way through the alliance. They obeyed their own chief, though he, in turn, generally did the bidding of the Macintosh chief who headed the confederation. The name of the clan is found in several forms . . . the two we have mentioned as well as MacVean and McBean. Possibly because of its strong ties with the Macintoshes, little is known of the family. As well as in their own country round Dores, on the shores of Loch Ness, the name is common in parts of Perthshire and the form MacVean was found in Breadalbane and Glenorchy. One old manuscript says the first MacBean cam from Lochaber to support Eva, an heiress of Clan Chattan, about 1300. Bean Mhic Coil Mor and his sons were alleged to have slain the Red Comyn’s steward at Inverlochy Castle; at this time the Cummings and the Macintoshes were at daggers drawn. According to the Kinrara manuscript (1670) Bean Mac Maolmor lived near Inverness in 1334. One thing is known about the clan, however; they suffered appalling losses at the Battle of Harlaw in 1441 when Clan Chattan played an important part in halting the triumphant MacDonald of the Isles. The same manuscript tells us that following the death of the steward, Macbean and his sons went to the Macintosh chief promising him their loyalty; in return, they asked and obtained his patronage and safeguard for themselves and their clansmen. The main family of the Macbeans was Kinchyle, in Dores, and the first head of the clan seems to have been Paul Macbean of Kinchyle. The chiefs following him were Gillies, William, Paul, Angus, and John. 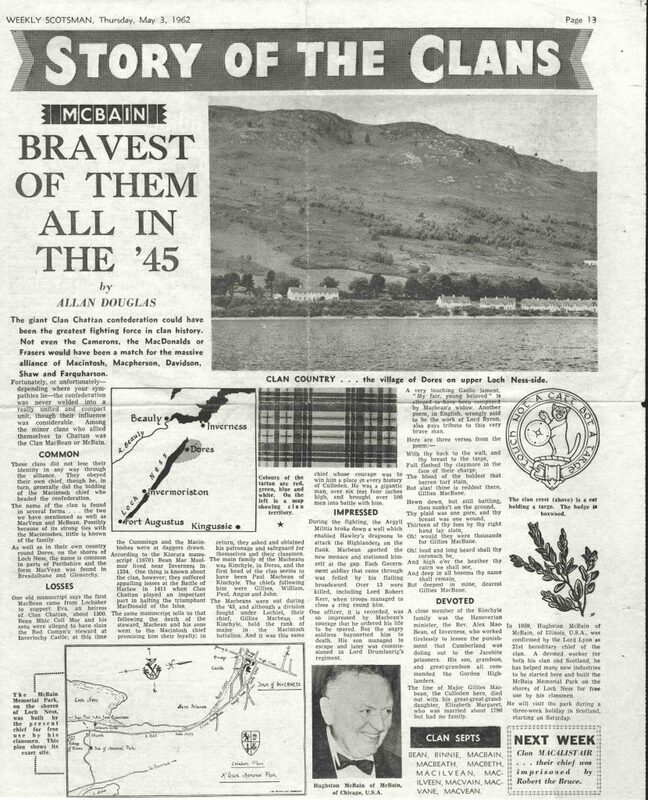 The Macbeans were out during the ’45, and altough a division fought under Lochiel, their chief, Gillies Macbean of Kinchyle, held the rank of major in the Macintosh battalion. And it was this same chief whose courage was to win him a place in every history of Culloden. He was a gigantic man, over six feet four inches high, and brought over 100 men into battle with him. During the fighting, the Argyll Militia broke down a wall which enabled Hawley’s dragoons to attack the Highlanders on the flank. Macbean spotted the new menace and stationed himself at the gap. Each Government soldier that came through was felled by his flailing broadsword. Over 13 were killed, including Lord Robert Kerr, when troops managed to close a ring round him. One officer, it is recorded, was so impressed by Macbean’s courage that he ordered his life to be spared. But the angry soldiers bayonetted him to death. His son managed to escape and later was commissioned in Lord Drumlanrig’s regiment. A very touching Gaelic lament, “My fair, young beloved” is alleged to have been composed by Macbean’s widow. Another poem, in English, wrongly said to be the work of Lord Byron, also pays tribute to this very brave man. But alas! thine is reddest there, Gillies MacBane. Oh! would they were thousands for Gillies MacBane. And deep in all bosoms thy name shall remain. But deepest in mine, dearest Gillies MacBane. A close member of the Kinchyle family was the Hanoverian minister, the Rev. Alex MacBean, of Inverness, who worked tirelessly to lessen the punishment that Cumberland was doling out to the Jacobite prisoners. His son, grandson, and great-grandson all commanded the Gordon Highlanders. The line of Major Gillies Macbean, the Culloden hero, died out with his great-great-granddaughter, Elizabeth Margaret, who was married about 1790 but had no family. The clan crest (above) is a cat holding a targe. The badge is boxwood. In 1959, Hughston McBain of McBain, of Illinois, U.S.A., was confirmed by the Lord Lyon as 21st hereditary chief of the clan. A devoted worker for both his clan and Scotland, he has helped many new industries to be started here and built the McBain Memorial Park on the shores of Loch Ness for free use by his clansmen. He will visit the park during a three-week holiday in Scotland, starting on Saturday. Right click (in the middle of the image) chose open image in new window or tab. Left click and image will magnify for easy reading.